This fish only marine system in a North London home is 3.5 metres long by 2.5 metres high. It provides a beautiful focal point for a reading room. 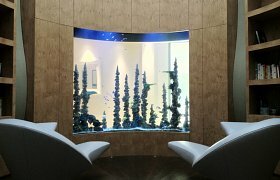 The aquarium is curved to complement a circular room and, whilst this presented a few challenges, has made for a truly unique aquarium. The pipework was imported from America especially for the aquarium and 15 degree 2” and 3” elbows were used to run pipework round the room, through a wall and into the adjoining garage, where the bespoke filtration system is housed. In order to accurately capture the client’s vision, we used a series of moodboards. These were then followed closely when aquascaping in order to achieve a striking, high-end finish to this exceptional aquarium.